As we near the end of long days on the floor and near the 2019 session’s adjournment on April 28, we appreciate your readership and feedback. Keep letting us know how we’re doing by hitting reply or sending an email here. There are two weeks left until the planned end date for the 2019 session, and over 550 bills are still alive. Based on a review of bill titles: There are about 35 environmental bills left in-play, 20+ housing bills, about 45 education-related bills, over 50 health care bills, about a dozen behavioral-health bills, and at least five bills aimed at Southern Resident orca whale recovery. Many of these bills will be held over to 2020, as the Legislature increasingly narrows the work it will accomplish in the last few days. As of noon today, the chambers have 29 hours left to vote on non-budget-related bills that originated in the opposite house. Tune into floor activity live via TVW’s House and Senate channels. The House passed a Senate bill last week requiring Washington’s electric utilities to transition to 100% carbon-neutral supply by 2030 and 100% carbon-free electricity by 2045. The bill, a major component of Gov. Inslee’s clean-energy plan, now goes back to the Senate for a concurrence vote. 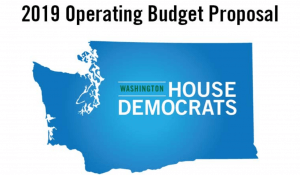 George Caan, Executive Director of the Washington Public Utilities District Association, told me the WPUDA stands by the principles of least-cost and technology-neutral, including hydro, policy that focuses on carbon reduction in a meaningful way. “There’s a lot to be said for those principles being embodied in this bill,” Caan said, calling out the bill’s flexibility, cost cap, and inclusion of hydro in the carbon-neutral standard as positives. Still, WPUDA is not in full support nor full opposition of the bill. There are a couple changes utilities would like to see (hydro tax parity, as featured in a failed amendment by Rep. Steele, is one). Btw, thanks for being a sponsor of our Re-Wire Policy Conference, WPUDA! In the next 10 days, we’re likely to hear who has won the race for House Democratic Leader. Among the names folks have mentioned this session are June Robinson of Everett, Monica Stonier of Vancouver, and Laurie Jinkins of Tacoma. Each of these candidates are compelling in their own way, and would bring a new style of leadership to the House. Filling Frank Chopp’s shoes won’t be easy. In fact, it’ll be hard, particularly with Chopp remaining in the caucus as a rank and file member. And, with a re-districting map that provides a +7 advantage to Republicans, it’s altogether possible the next Democratic speaker will be the last one for some time. Friday, the House passed a Senate bill with the goal of protecting immigrant workers in Washington. Among other actions, it limits information sharing between local and state law enforcement and federal law enforcement and requires agencies to provide services without regard to a person’s citizenship or immigration status. The bill now goes back to the Senate for a concurrence vote. Its passage comes in the middle of a national debate surrounding a plan to move undocumented immigrants to sanctuary cities. Seattle Mayor Jenny Durkan is part of that conversation, after penning a weekend Washington Post op-ed titled, “We’re not afraid of immigrants, Mr. Trump” and reiterating her stance on MSNBC’s Hardball. At the state level, Gov. Inslee called the federal plan “yet another act of bombastic chaos” by President Trump on Meet the Press. Of the $2.25 million, according to the campaign, 75% of contributions have been $25 or less and 95% of donations have been $100 or less. “This first-month fundraising shows strong grassroots momentum for Gov. Inslee’s message of defeating climate change,” campaign manager Aisling Kerins said in a press release. Meanwhile, Inslee’s popping up all over the media landscape: In the last week, he’s hosted a CNN town hall, NowThis News covered his roundtable with people impacted by flood damage in Iowa, he went on The Beat with Ari Melber on MSNBC, made an appearance on the podcast Pod Save America, and showed up on CBS This Morning. He’s still largely focusing on climate change, but is starting to be pressed on other big-ticket issues, like health care.